The East Coast has been holding their collective breath this past week as to whether or not Hurricane Earl was going to just wave in passing or start banging on the door asking to be let in. It looks like we're all going to dodge the bullet of an unwanted visitor but that hasn't stopped schools from closing early, crowds visiting the grocery stores for bread and milk, and the usual ridiculousness that now goes along with any predicted snowstorm. Sometimes I think that all of this Doppler high-tech weather predicting is wrong more than its right but ah well ... better safe than sorry, right? 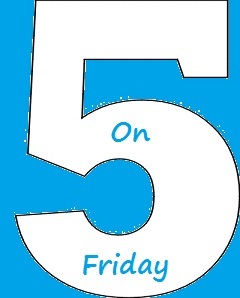 Anyhow, all that aside, I decided to use the impending storm and rain as an incentive for this week's Five on Friday, the weekly musical meme hosted by Travis of Trav's Thoughts. The rules - such as they are - can be found over on his blog and you are more than welcome to join us some Friday and share some of your musical favorites with us. In addition to the five songs on the player, you'll find a bonus video below chosen in honor of my friend Jamie who loves all things musical on Broadway and because you just can't have songs about rain without having Gene Kelly! Excellent selection of stormy songs...you could have added Stormy Monday too! It's just raining all over the place. I love them all especially Singing in the Rain. Now aren't you clever with all these rainy songs! how creative! We dodged a bullet here in Baltimore too. Whew. Don't know if I could handle another major weather event this year! Why thank you maam. He was running a temp of 103 with flu while filming that number. The last time I saw Gene Kelly, was when the Three Tenors appeared in LA and the band started the vamp for "Singing In The Rain" and Gene stood to greet the audience who then stood and gave him a standing ovation for a lifetime of music and dance. Great selections,my Nephew says they dodged the bullet in the part of Long Island where he is. Now that's a selection! And thanks for throwing in the video...it's one of my favorite musical moments.